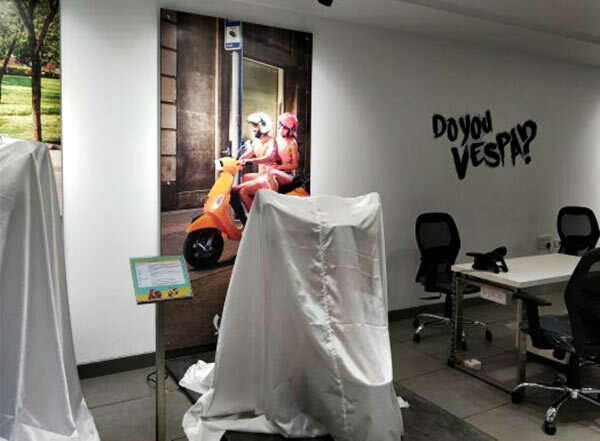 We first reported about the launch of new Piaggio Motoplex showroom in Bengaluru. With four successful Motoplex launches firmly under its belt, the Piaggio Group today announced the launch of its latest Motoplex addition in Bengaluru. The Motoplex was inaugurated by Mrs. Chamundeshwari Ramalinga Reddy, wife of Honorable Home Minister of Karnataka, Mr. Ramalinga Reddy, Mr. Diego Graffi, CEO and Managing Director and Mr. Ashish Yakhmi, Head of Two-Wheelers, Piaggio India. The new Motoplex is set in a sprawling space of 8,000 sq. ft. at KMJ AVEN, Outer Ring Road, Bengaluru. Like its predecessors, the new Motoplex is a place for patrons to discover the essence of the Piaggio Group and its lineage with brands like Vespa, Aprilia and Moto Guzzi on display. In addition, the Motoplex provides biking enthusiasts the platform to explore their favourite Piaggio brands. The Motoplex is an innovative concept and we are proud to bring our flagship store to Bengaluru. Through the Motoplex, we aim to provide our patrons with an exciting overview of our Italian heritage and diverse product range. With the launch of the new Motoplex, we aim to further strengthen our growth in South India, a strategic two- wheeler market. After Chennai, Hyderabad and Kochi, it was a logical move to bring this concept store to Bengaluru. We are delighted to introduce this new retail experience by Piaggio in the format of a Motoplex. It is our pleasure to be representing Piaggio’s premium brands in Bengaluru. The first Motoplex was set up in India in Pune in November 2015 followed by launches in Hyderabad, Chennai and Kochi where all the Piaggio group brands coexist in one continuous experience.